“‘Working together, involving all’ has been my motto, and I strive to live it every day,” Mary wrote in a recent column in her local newspaper, expressing gratitude for a Lifetime Achievement Award she recently received. 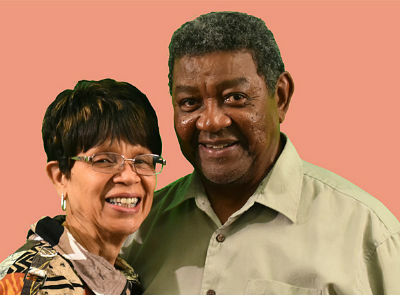 Instead of leaving a low-income community during its toughest times, Mary and Cornelius chose to love their neighborhood and live a missional life right where they were (and still are). Over the years, Mary has taught in the public schools, co-founded an innovative educational nonprofit, mentored countless students, and helped organize a tool bank and food pantry that serves more than 150 families every month. 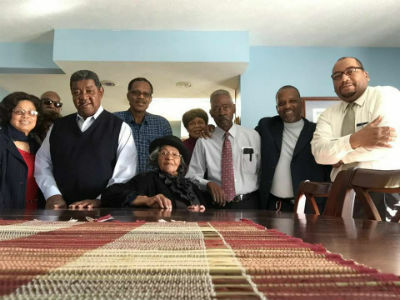 Through it all, her husband Cornelius Dollison has been by her side, as has the faith community at Kirby Avenue Church of God in Muncie, Indiana. “It is incredible what can happen when God lets us work together,” Mary says. Through her investment in the Whitely Community Council (an effort to empower and promote a safe and healthy neighborhood), seventeen churches across Muncie regularly join forces to show Christ to all people. In case after case, the Dollisons share examples of making Jesus—not the church—the subject. 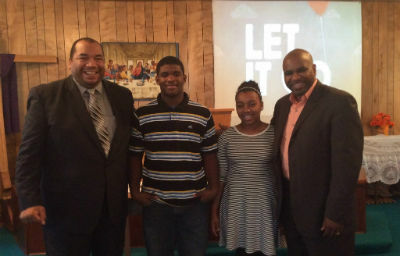 Photo: Handel Smith (far right) and Pastor Mitchell (far left) at Kirby Ave. In another instance, the Dollisons and the community council raised funds to save Muncie’s historic AME church. And, as always, their influence trickled down to the younger generations: Mary spoke proudly of two young African American men who achieved their Eagle Scout awards through landscaping the church yard and repairing the parking lot. Jonathan Mitchell, Kirby Avenue pastor, agrees, saying the key is working together and trusting God. When he came to Kirby Avenue a year-and-a-half ago, he “had a three-year plan to get to know my congregation, know their gifts, and know where to serve. But that went out that window,” he quips, “because these people were already serving everywhere!” Now Pastor Mitchell encourages and joins his flock in intentionally working with other churches in the area, attending a Bible study with pastors from across the city, and serving on a board of local community organizations. He likens it to Pentecost, where followers of Christ were joined in prayer and sent forth in service through the Holy Spirit. This entry was posted in All Church of God, Great Lakes and tagged community outreach, community service, discipleship, ecumenical, evangelism, faces of the movement, Indiana, interdenominational, Jesus Is the Subject, Jonathan Mitchell, kingdom, Kirby Avenue Church of God, Mary and Cornelius Dollison, missional, multicultural, Muncie, neighborhood, planting seeds, Reclaim, reclaim your neighborhood, reclamation, unity, urban, witness. Bookmark the permalink.